Get on the list below for my next class January 2018! Are you someone who wants to focus, study and implement a lifestyle that fits who you are in this moment? You have or need a vision of a new lifestyle- but need clarity and accountability to make that vision a reality? What is the next thing I'd like to do in my life? Do I have a concrete vibrant vision so that I can be fulfilled and energized? What do I need to do – to get to where I want to be next? WOULDN'T IT BE GREAT IF I....? LUX LIFESTYLE: BusinessLife moves you into action and boosts your confidence - so that you can start sharing your vibrant message with the world! LUX LIFESTYLE- Created by Nanette Perrotte. Nanette teaches her best pro-tips from 20+ years working as a voice coach, yoga teacher, college professor, Jazz lecturer and solo-preneur with performing artists, writers and creative entrepreneurs- just like you! She comes from two generations of family of entrepreneurs in the service industry. 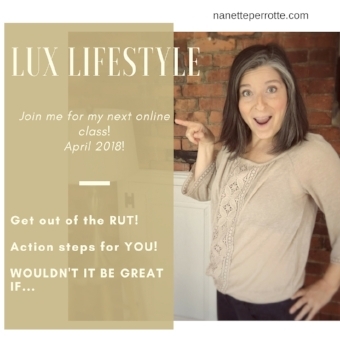 Nanette knows what it's like to have that entrepreneurial desire- to live life to it's fullest potential and, at different points of life, question what it is you should be doing NOW. In 2000, she created and ran Creative Building Blocks- an arts integrated program for pre-school students. At the same time, she built a private voice studio and gigged in Jazz clubs throughout New England with the Nanette Perrotte Combo. In 2015 she left teaching college to travel the USA as a Jazz Lecturer and create and teach a highly successful Video Marketing & Broadcasting Course with Halvorson New Media. Nanette's creative entrepreneurial journey answers that same siren call that YOU hear too. I hear you. I believe you. LUX LIFESTYLE: BusinessLife gives you workable starting points and breaks it all down for you in the online course videos, live office hours and downloadable worksheets. 3 weeks of coaching with Nanette - including office hours! How do I apply for the class? Are you ready to catapult with CONFIDENCE into the next part of your life? LUX Lifestyle: BusinessLife is for the motivated individual ready to amplify their passions and pursue a goal, vision or project. If this is YOU, fill out the info and click below. Next class begins January, 2018. Tuition for Lux BusinessLife 3 week class is $197.00!